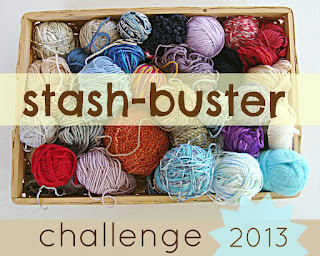 In April I joined the Stash Buster Challenge to get rid of a stash of baby yarn I have. It's one of the easiest stitches to do. I used a size N hook, but depending on how tight you want to make the weave, you can use as small as a K. I used 1 1/2 skeins of 10.5 ounce size. (Yes, this is a pig on yarn, so plan accordingly). To make a blanket about 33" inches square, you start off with chain 53. (It's 2 + 1 regardless of the size you want.) Row 1: Make a double crochet in the third hook from the last chain and double crochet all the way across. Chain two. 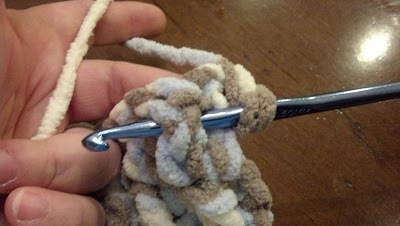 Row 2: Make a single crochet on the second chain from the hook. Yo and run the hook behind the post immediately below, yo where your hook comes out on the left side of the post and pull back up. Continue across Row 2. You should end with a single crochet. Chain 3. Row 3 is another row of double crochet. Chain 2. Continue with Rows 2 and 3 until you get the desired length. Make sure you keep those special posts lined up with the ones below. 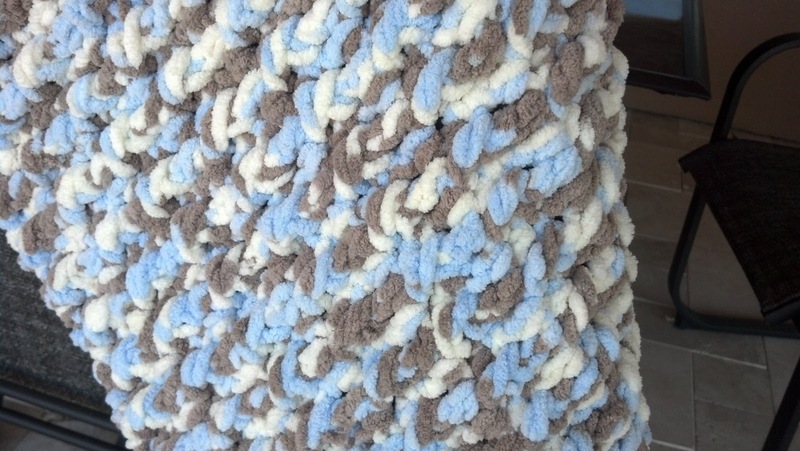 That's probably the hardest part, but generally this is a very easy blanket to make. The look of this is great because one side has these ridged posts and the other has almost a basket weave look. 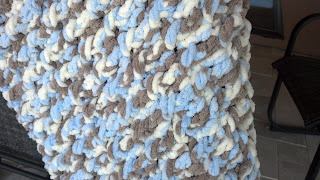 If you want to do a single crochet border, that's great, or any other border you would like. I wouldn't get too fancy because this is very thick yarn and by this point you've probably used more yarn that you would like. However, you will love the results - a thick and very soft blanket. I hope you love it as much as I do! My kids are 10 and 12. They've always been good kids and generally well behaved. I ask them to do something and eventually it gets done. Yes, I may have to ask more than once, but no one has perfect kids, right? 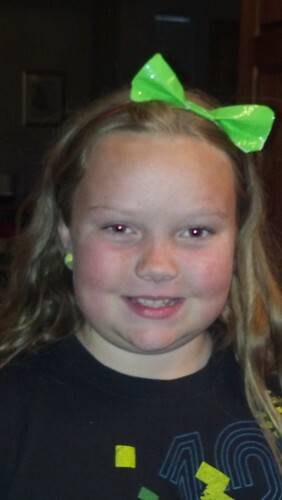 Recently I've started to hear things I have never heard before coming from my children's mouths: Why? How come? Now? When it first started happening I was too surprised to respond or I tried to explain why, how come, and when I needed them to do what I asked. Today, after I asked for something to be done and heard "why," I was shocked to hear my own voice with my mother's words. "Because" I said, "Because I said so. Because I'm your mother, and I don't need a reason to ask you to do something." Whoa, who is that? It's my mother. I've become my mother! You know what? It's O.K. What else would I say? It's true. They should do things because I asked them, I'm their mother and I don't need a reason to ask. Right? But I know more is coming: "When donkeys fly" (That's a particular twist from the usual "when pigs fly" courtesy of my mother. ); "As long as you live under my roof;" "I'm the mother and you're the child;" and my personal favorite that has been handed down from my grandmother and then my mother: "If I say white is black and black is white, then white is black and black is white!" I feel like I've attained an entirely new level of parenthood. I guess it's a transition I must accept. My kids are entering the testing phase. I guess I need to transition with them. I miss my mom - she died a few years back. But now, whenever I hear one of these statements coming out of my mouth, I will think of her and smile. And hope my kids are doing whatever I just asked them to do. 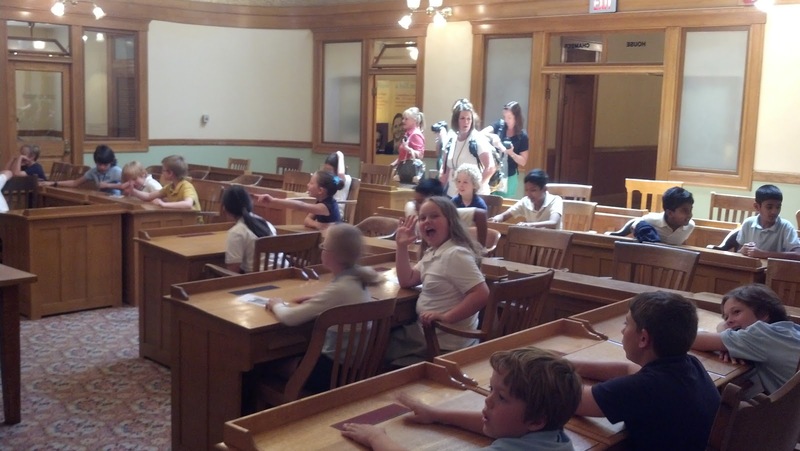 State capitols are largely overlooked when visiting a new state. That's too bad because most state capitols have some amazing history. Of course I'm a history nerd so I love that stuff. 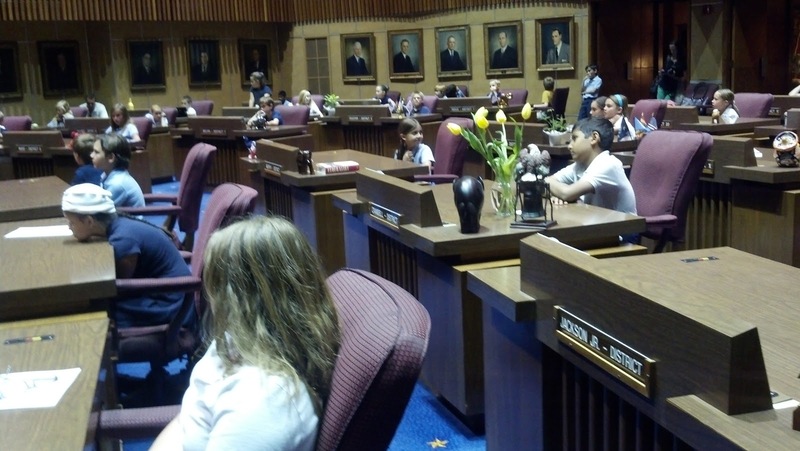 Before school ended Mackenzie's class visited the Arizona State Capitol, the Arizona House and the Arizona Senate in Phoenix. The original Capitol was built in 1901 when it was the territorial capitol. 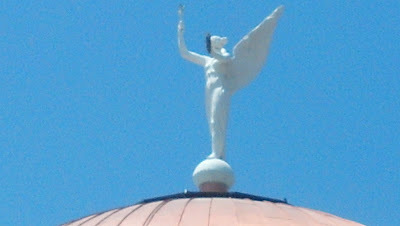 It proved to be too small for a new state, so additions were built in the back of the building in 1919 and 1938. Behind that is the tall modern executive tower that was built in 1974. If you enter the Capitol from the oldest end and walk straight through to the Executive Tower, it's funny because the hallway width and flooring changes as you walk though into each addition. She is a weather vane, turning with the wind. The story is that when the cowboys would come riding in, they would shoot Winged Victory to see her spin. 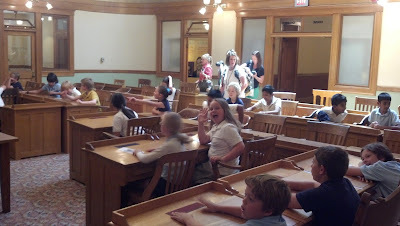 The kids especially liked their access to the Senate floor (which only happened because one of her classmates is the child of a senator). 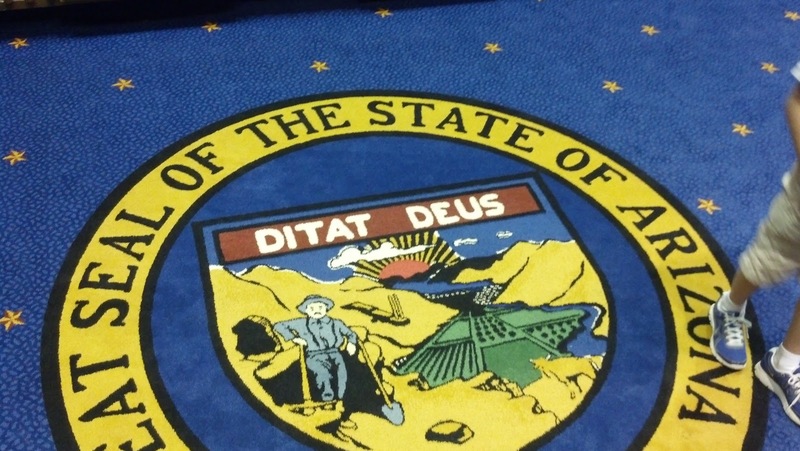 Here's the state seal with the 5 Cs of Arizona - cattle, climate, citrus, cotton and copper. Tourism doesn't begin with a C.
This summer I'm making a big checkmark on my bucket list. 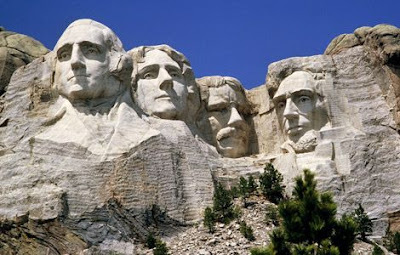 The great American family vacation - that's on my bucket list. It's a long vacation - 21 days - the longest vacation ever! Ever since I was a kid I wanted the big western family RV vacation. We're renting a RV and that's scary enough, but imagine a 21 day road trip with a 10 and 12 year old. We know the kids may not enjoy every day (or any day), but we are confident that it will be a vacation they will always remember. The journey begins in our home state - Arizona. We're not going to see the obvious - the Grand Canyon - because we've already seen it and can with only a three hour car ride. 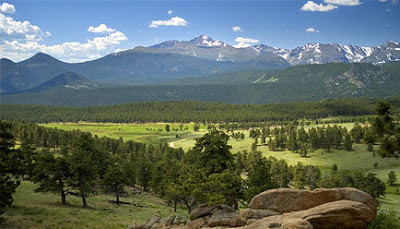 Instead, we'll be motoring through Utah, Wyoming, a bit of Idaho, Montana, South Dakota, Colorado and New Mexico. That's right, 7 states and nearly 3000 miles in 21 days! 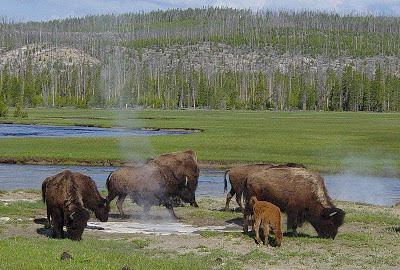 On the way we'll see multiple national parks, monuments and forests and some of the most beautiful places in the United States. Oh boy, this is going to be awesome! That's the name of a blog written by a 9 year old boy (he only identifies himself as "G" which is probably the wisdom of his parents). 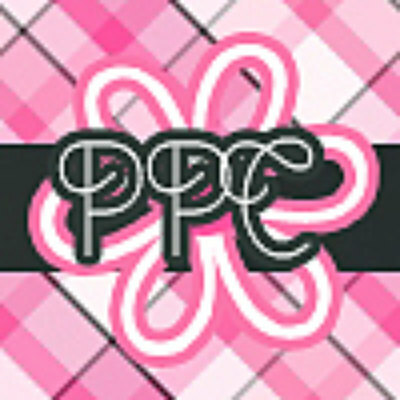 The exact blog address is www.iamgodshands.blogspot.com. 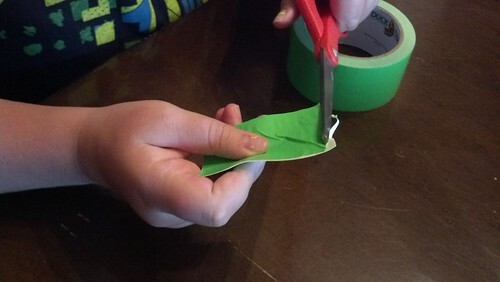 G makes duck tape wallets and billfolds. Great, you're saying, him and thousands of other 9 year olds make duck tape wallets and billfolds. This 9 year old is a little different. Then they will answer and say, 'Lord, when did we see you hungry or thirsty or a stranger or naked or ill or in prison, and not minister to your needs? He will answer them 'Amen, I say to you, what you did not do for one of these least ones, you did not do for me.' And these will go off to eternal punishment, the righteous to eternal life. G started his blog in January and the last entry was on Easter Sunday. I'm not sure why G hasn't posted lately (that's not an uncommon problem for bloggers), but I'm going to leave a comment on his last post to ask how he's doing with his project. I did notice that in the last post he mentions that his entire inventory was purchased, so maybe he's working on more duck tape wallets and billfolds. I hope so - I hope G is still God's Hands. I've already done a few for my Etsy store, PrettyPrettyCindy. 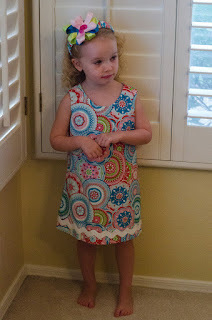 (The paisley dress is still available in size 4). This time I was ready for another variation (or two). First of all, the base fabric is a (lean in close 'cause I'm whispering) a . . . tablecloth. It is new, but I just loved the fabric and couldn't resist! As much as I liked the fabric, it needed some serious contrast, so I chose the pink and brown/pink paisley fabrics. 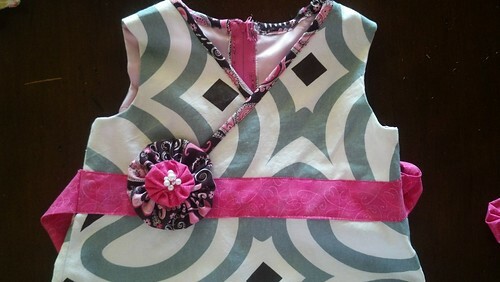 Next, I changed the neckline to make a more wrap-like look. 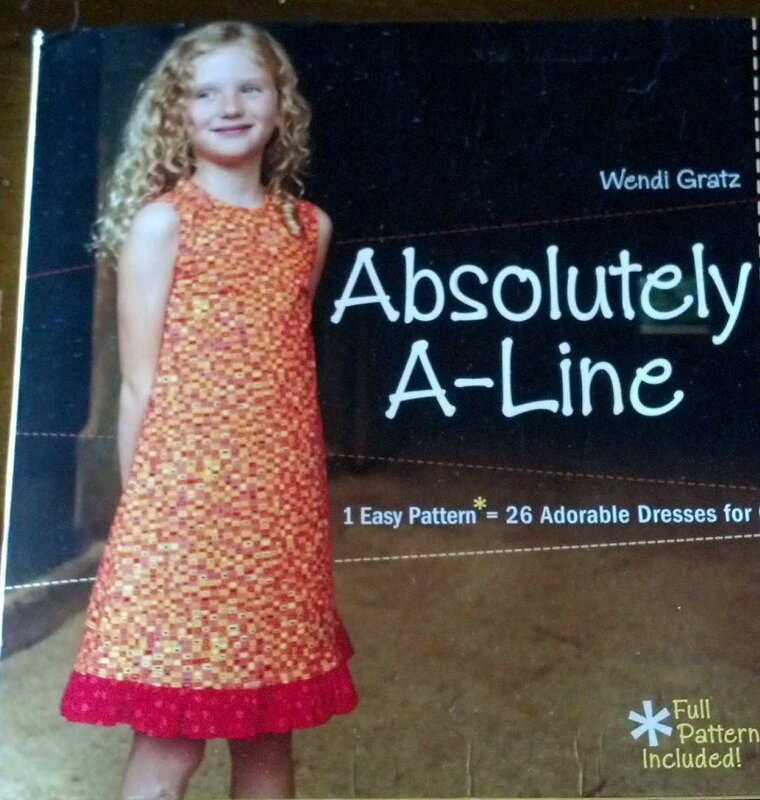 I did use a trick from Wendi's book to have the bias tape (the brown paisley fabric) show around the neckline. Because I kept the bias fabric thin, it almost looks like cording. 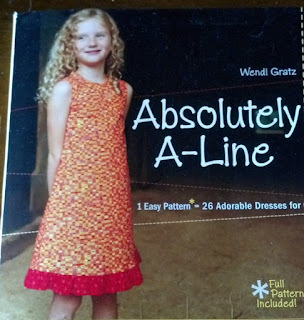 When I separated the bodice from the skirt, that left a "waist" that I really did not want to see in the main fabric because I like the illusion of a single straight A-line dress. Solution? 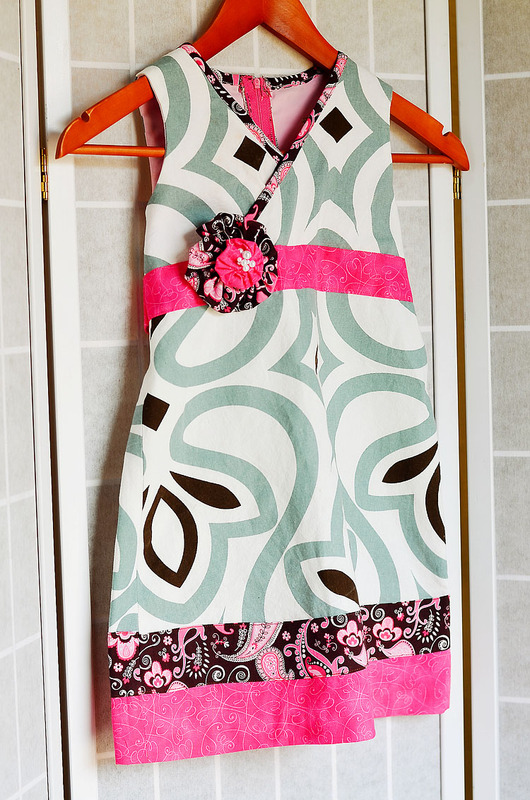 Create a "sash" at the waistline that ties in the back. 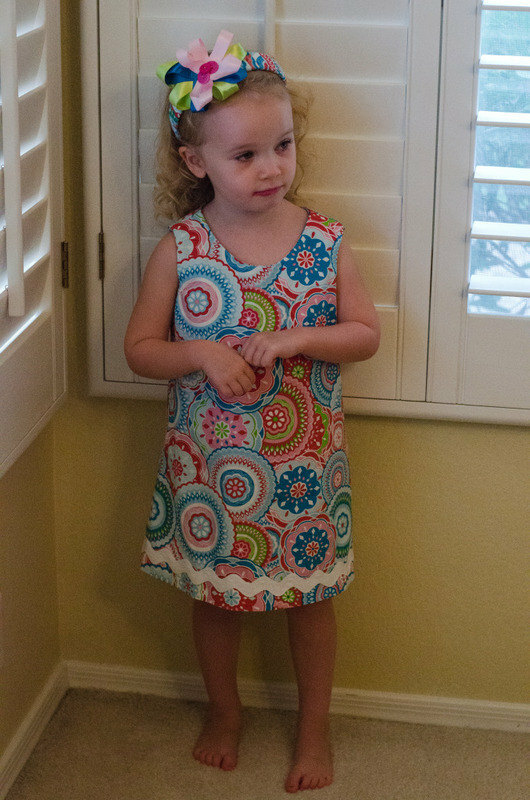 That wasn't too hard to do using another piece of another dress pattern. I still needed more contrast at the bottom and after adding the first strip, wanted more length so another strip was added. 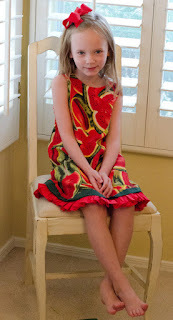 I wanted one more "touch" to make the dress different and special. I've been making yo-yos (those little flower thingies) for a while, but haven't had much use for them yet. You can see how to make yo-yos here. I layered two sizes of yo-yos and added a few seed pearls. It may seem a little funny to start with one idea and end up with another. That's what I like about Wendi's book. She's not wed to specific design functions which leaves me comfortable with experimenting with different elements. I like the outcome. 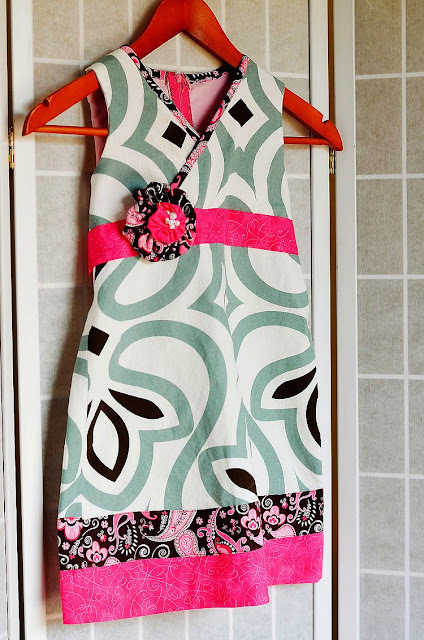 If you like it too, it's available in my Etsy store in a size 5. O.K., my first installment of "All About Arizona" is already a day late, but if you read my previous post about Father's Day, you'll understand why. BTW, the crafts we did for Father's Day will be featured soon because they can be used for a number of different occasions. You might notice a few "modern" items in the picture - the garbage bin and fire hydrant in the foreground, but that's because this isn't a movie set, it's the real thing. It's called "The Town Too Tough To Die" and it more than lives up to that reputation. It was built on a rush for silver and then mostly abandoned when the next silver rush popped up nearby. 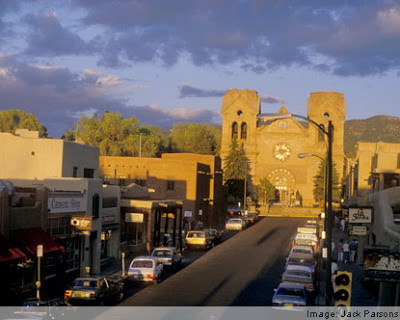 It has survived two devastating fires back in the day and countless acts of violence. This is definitely the heart of the Old West. 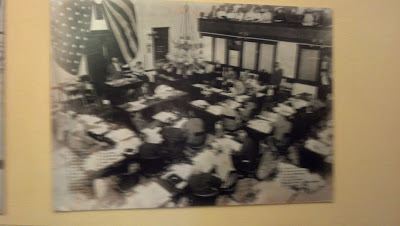 If you're looking to see what it was really like, here it is, much like the way it was in the late 1800's. 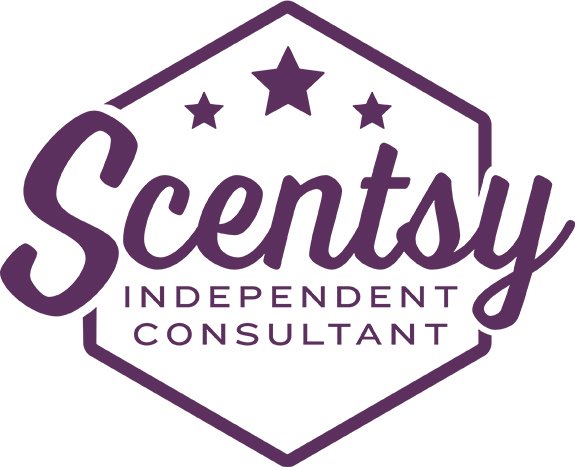 Ed Schieffelin founded it in 1877 while he was prospecting for "stones" deep into Apache territory. People told him "Ed, the only stone you're going to find out there is your tombstone," so when he struck silver, he named the prospecting town Tombstone. True story. 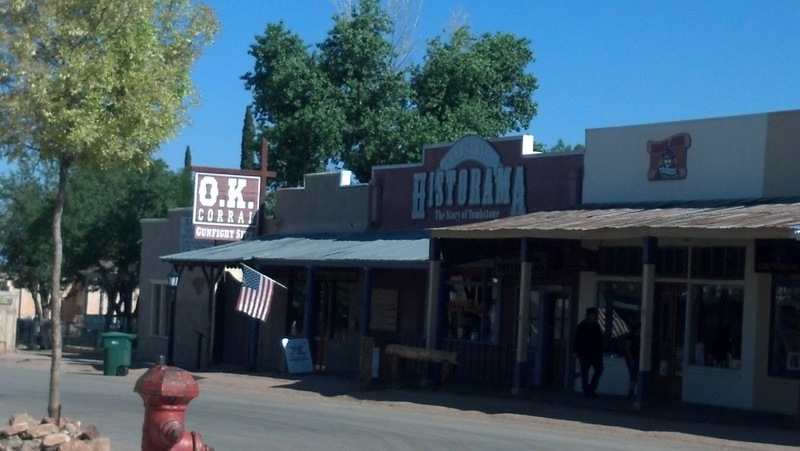 So much of Tombstone is straight out of a dime-store novel. By the mid 1880's, it was the fastest growing town between St. Louis and San Francisco. There were prospectors, lawyers, bankers, Chinese, Mexicans and a thriving brothel area with "ladies of the evening." 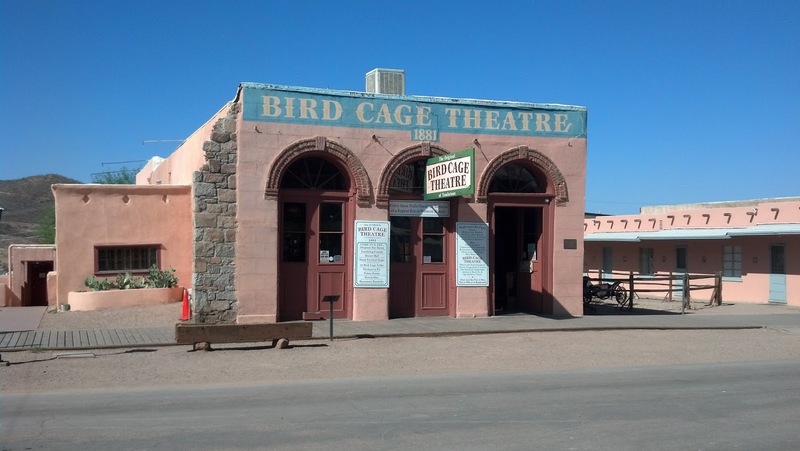 Tombstone has the oldest standing adobe structure in the United States, the infamous Bird Cage Theater. The Bird Cage theater was a combination saloon, theater, gambling hall and brothel. Today visitors come to the Bird Cage and can see the original stage and reserved boxes on the upper level overlooking the theater. Those were favorite areas for rich gentlemen who were not only entertained by the act on the stage, but also by the prostitutes who shared the "private box" with them. It is said that girls entertained the patrons by swinging from ropes strung from the ceiling, inspiration for the song "Bird in a Gilded Cage." There are over 140 bullet holes you can see in the walls. In the basement of the Bird Cage Theater there is a museum of sorts - the former brothel where you can see actual relics and insight into the small, cramped and dirty rooms where infamous prostitutes worked. If you go to the other end of Allen Street, you'll find the O.K. 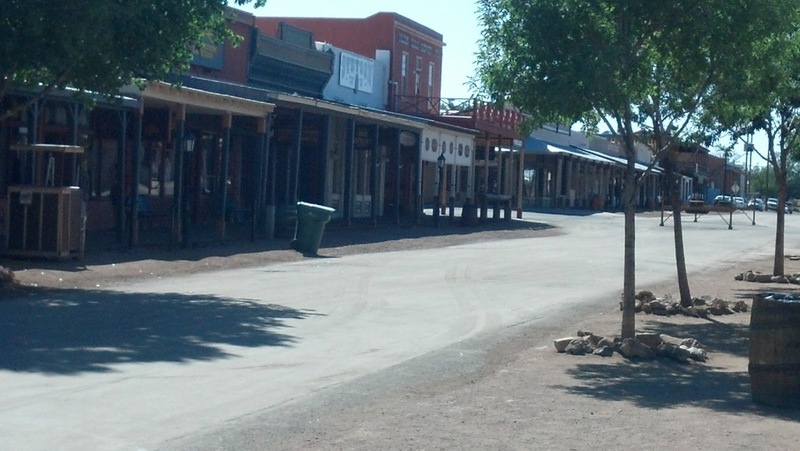 Corral, the place where the Earp brothers and Doc Holliday clashed with the McLaury boys and Billy Clanton. The gunfight wasn't actually in the O.K. Corral, but on a side street. It is still a subject of debate who shot first and the descendants of the McLaurys and Billy Clanton insist the Earps were the lawless ones, even if Wyatt Earp was the lawman. Typical of Tombstone, Wyatt Earp didn't escape until after two of his brothers were ambushed and shot down in revenge for the O.K. Corral. Lawlessness was a common theme in Tombstone, and probably the reason it still survives as a place for tourists. While it sounds somewhat romantic in a western kind of way, you can't hang around Tombstone very long before you feel the pall of the horrible stories of killings, assassinations and senseless violence that still scars the buildings and businesses that remain, despite the fires in the 1880s which twice destroyed the town. Just in case you aren't sensitive to the many crimes that occurred in the streets and the buildings you are walking through, today there is a show that depicts most of the most horrific ones (probably not for younger children). One of the more famous buildings where some semblance of justice occurred is the Tombstone Courthouse. 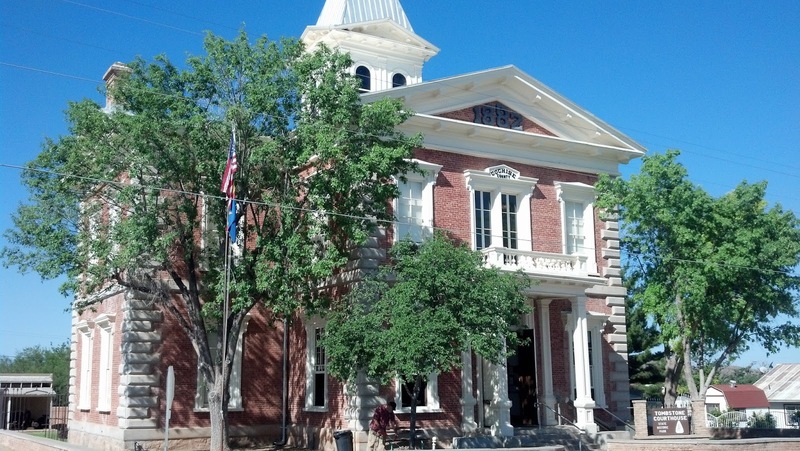 Built in 1882, it was the county seat for Cochise County (which has since relocated to Bisbee). It's a beautiful structure, with original courtrooms and offices that offer a bit of a respite to the crime that plagued the rest of town. After the mining industry pulled out over $37 million in silver in the hills surrounding Tombstone, the mines flooded and the prospectors moved on, taking with them the other people who supported the town. In the 1930s the population sunk to about 150. Today it stands at about 1500. 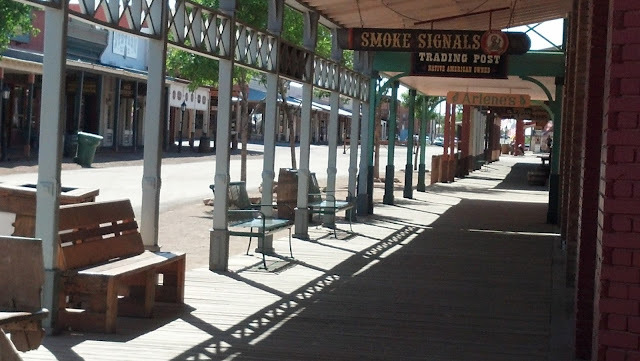 If you visit Arizona and get a chance to venture to the southeastern part of the state, you must see Tombstone. 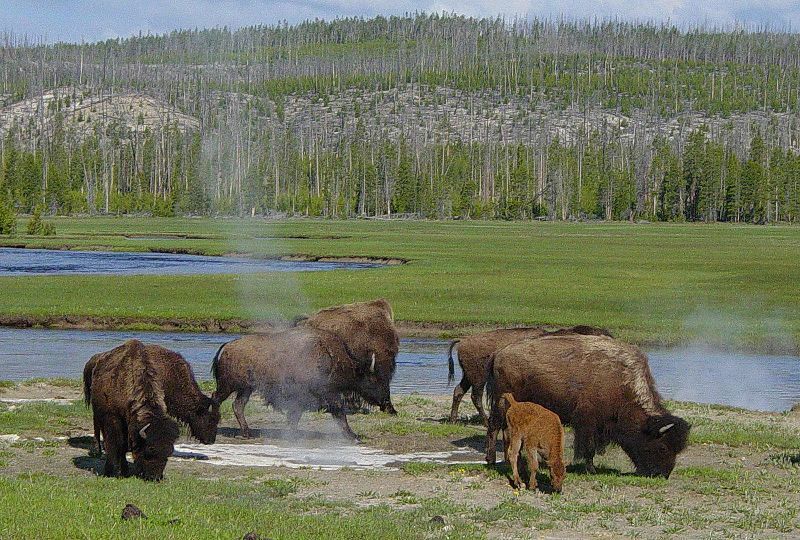 It is the real West, in its original glory and stark evidence of what that "glory" actually means. Please don't take my comments about the history of Tombstone suggest it is not worthy of a visit, whether you live in Arizona or not. 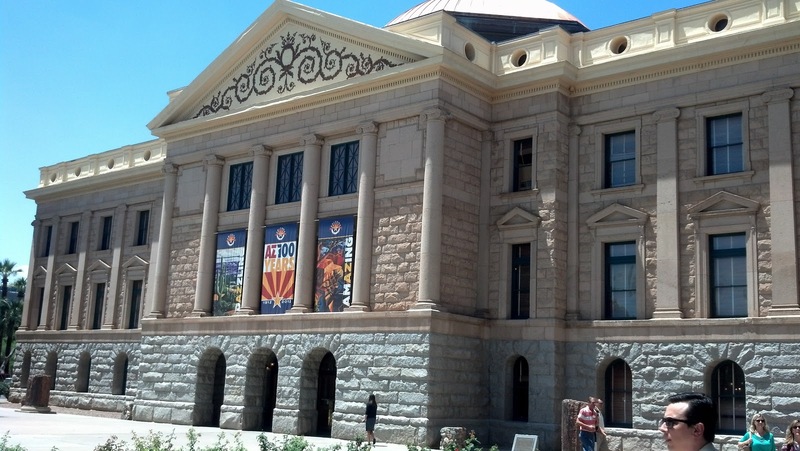 In fact, every Arizonan should visit to get a better idea of how the state was built. History isn't always pretty, it just is. Father's Day Gifts - ACK! Yep, you've waited until the last minute and don't have a clue. Neither do your kids. You know who you are - me. I've been looking around and I found some good ones - here are 10. 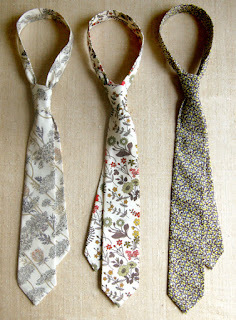 Five you can make (so your kids have some part in this endeavor) and the other five you can buy. Click on the title to see more, including the source. 2. 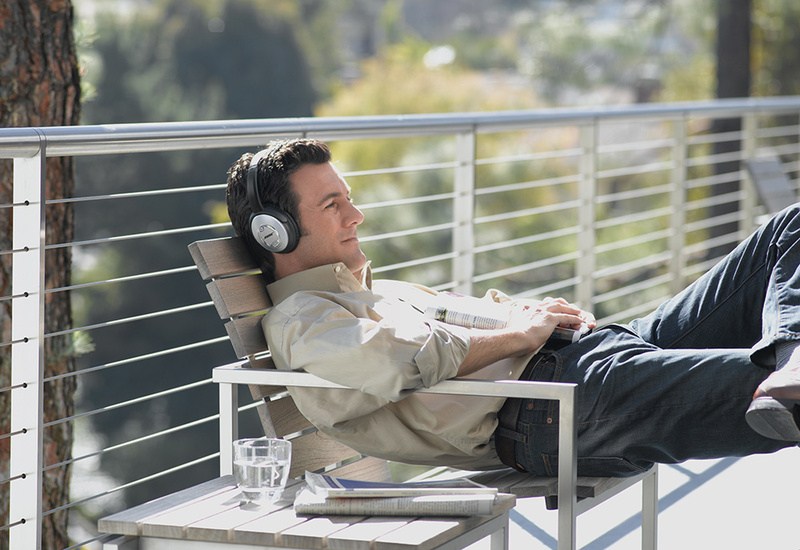 Bose Headphones - These are a bit on the pricey side at Sharper Image, but imagine the joy your husband will have blocking out the sounds of the children. If you don't want these expensive noise canceling headphones, you can always find some less expensive ones and get your children to keep the noisy ruckus to a minimum. 3. 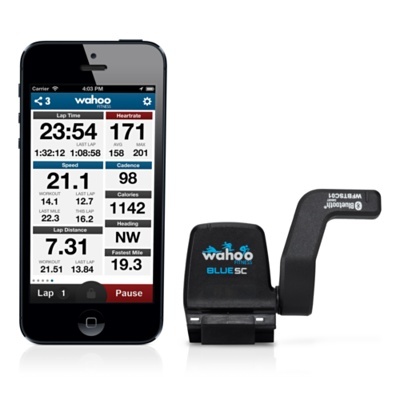 IPhone Cycling Accessory - This is a great gift for the dad who can't put his I-phone down, even while he's riding his bike. (People think using an I-phone while driving a car is dangerous, imagine riding a bike!) Apple has these items for $59.95 in its store. 4. Magazine Subscription - These are really easy gifts, especially for last minute, because all you need to do is go down to the local grocery or drug store, buy a magazine and tell him they will be in the mailbox for the next 12 months. (The gift that keeps on giving!) Some good suggestions - Men's Health, Sports Illustrated, Esquire, Forbes and Time. 5. 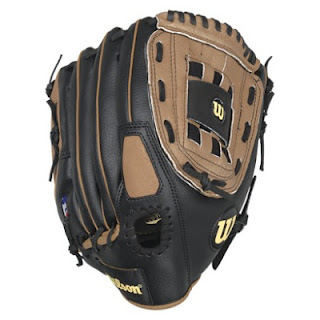 Baseball Glove - This is a great idea to get him outside playing with the kids. If baseball or softball is not the game for your family, think of another and get him some equipment - bowling ball, bike, golf clubs, basketball. This doesn't have to be an expensive gift - this one from Target is only $24.99! 6. Homemade Gift Basket - You pick your theme - sports, music, grilling or his favorite hobby - and fill it with lots of goodies. Game tickets, equipment, I-tunes or other gift cards, a bottle of wine, cigars, you get the idea. 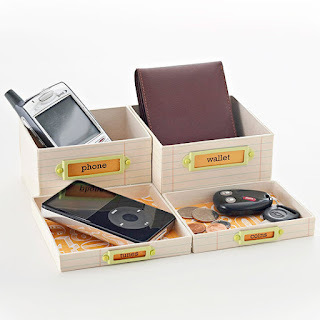 This is a great way to turn small things into a thoughtful gift. 8. Father's Day Coupons A co-worker of mine told me today that the Father's Day gift he wants the most is one day when his children don't fight. (Me too!) Here's an idea that might buy dad that and more. These are nice ones - made by Martha Stewart. 9. 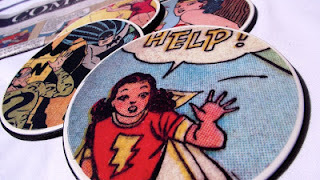 Mod-Podge Coasters - I love this idea because you can create these with any theme you want - pictures of the kids, favorite sports team and this great one - superheroes! These are from Mod Podge Rocks. 10. Valet Tray - Here's another one of those gifts that you can personalize using the basic pattern. Dad can keep his phone, keys, wallet - all those little things he can never find one he puts them down. Well, now I have a few ideas. Hopefully I can execute them by Sunday. Hey, it's only Friday - live on the edge! 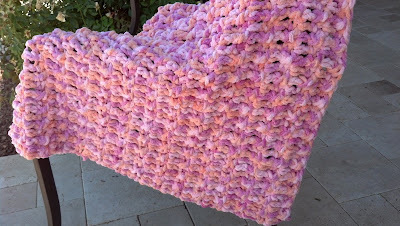 I've been doing a lot of crocheting lately and making a lot of baby blankets. 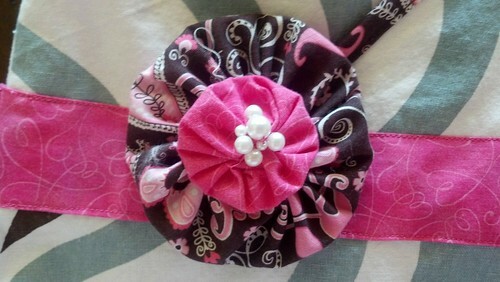 They are selling pretty well in my Etsy store, Pretty Pretty Cindy, and it doesn't hurt that I need so many baby gifts. 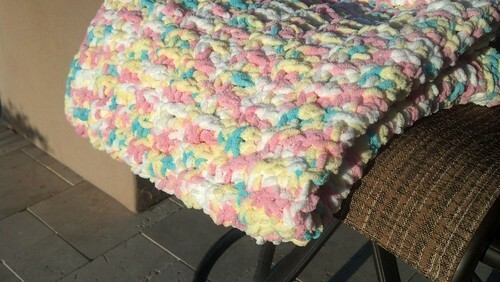 The best part of is I get to use my favorite yarn, Bernat Baby Blanket. If you crochet or knit and haven't seen this yarn, you are really missing something. This yarn is thick and the absolute softest yarn ever. 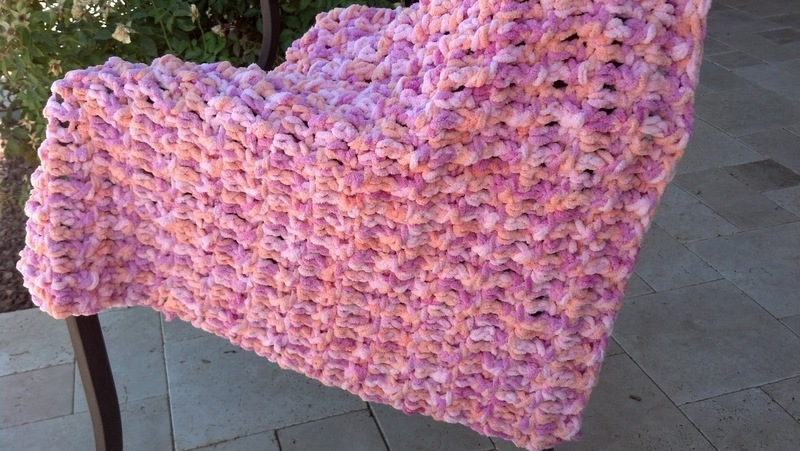 It feels like chenille and babies love it. 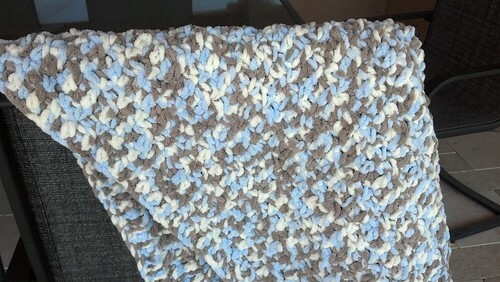 I had one customer whose baby liked it so much, she ordered a second one for day care. It's a joy to work with. Isn't that cute? As you can tell, I'm pretty proud of this work. 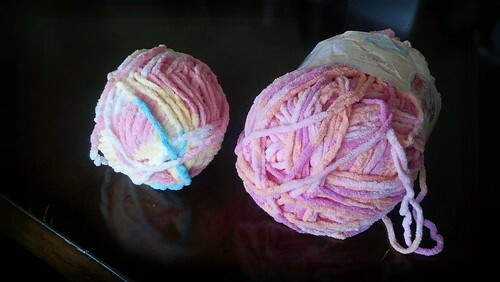 I'm definitely going to keep using Bernat Baby Yarn. Watch for more coming soon. 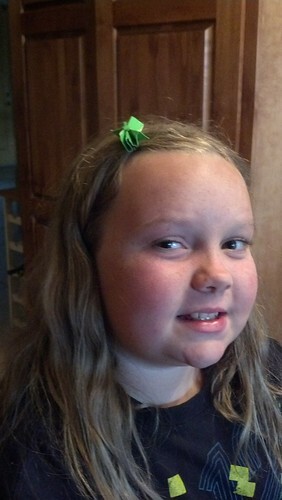 Duck tape, bobby pin, scissors and headband (optional). 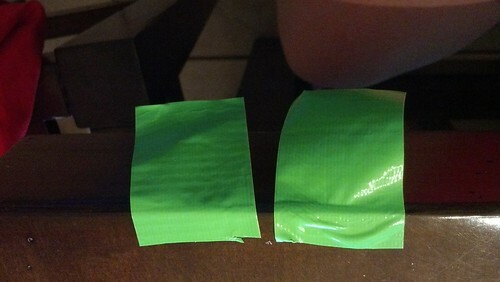 Cut two pieces of duck tape about 3 inches long. Put the pieces together with the sticky sides. 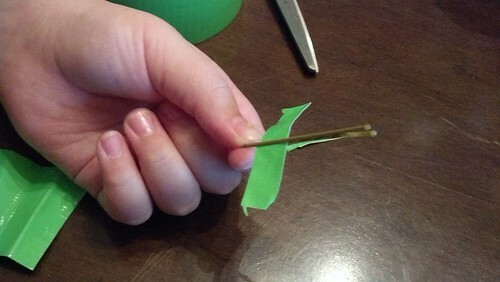 Cut the sides of the tape so the edges are even and no sticky part is showing. 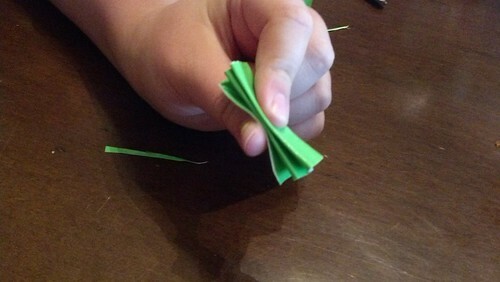 Fold the short side in accordion folds (back and forth). 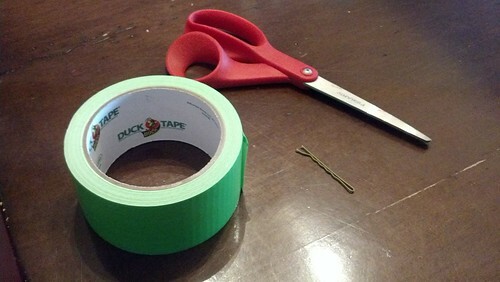 Cut another piece of duck tape, using the width of the tape as the length and cutting the width to 1/2 inch. 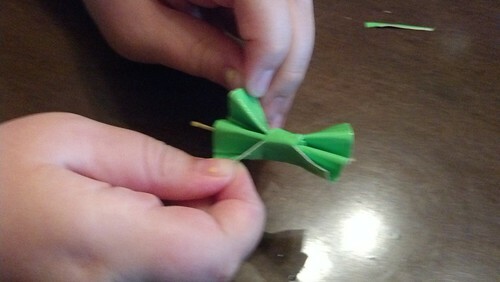 Insert the little strip between the bobby pin and wrap it around the folded piece. 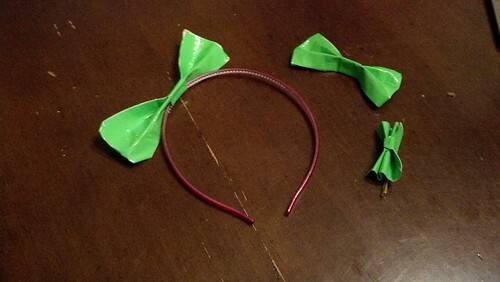 You can also do the same thing with larger pieces to make a larger bow for a headband. 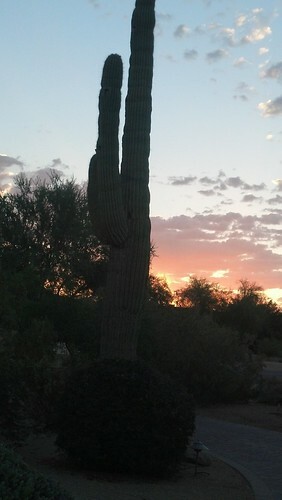 I've lived in Arizona now for 17 years and I love it here. 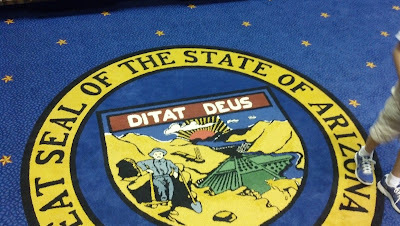 It's a great state, full of interesting places, climate, plants and animals you can't find anywhere else. I have frequently written about those things, but now I want to make it a regular feature. Every Saturday you can read a blog post about Arizona. 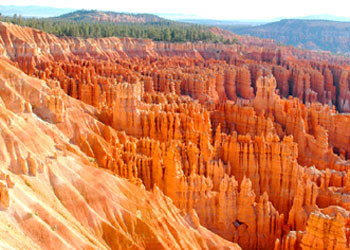 It might be an experience, place or general view on life here in the Valley of the Sun. 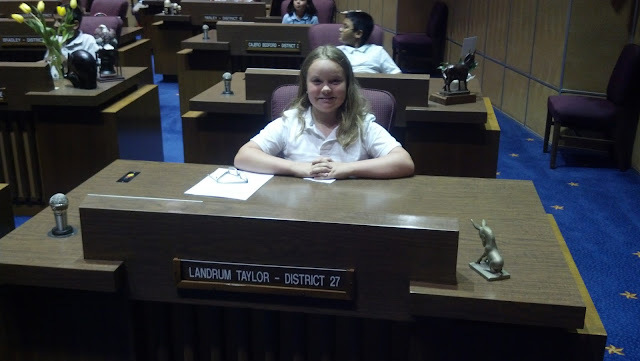 I love writing and learning more about my adopted home state and I hope you enjoy reading. Join me all (out and) about Arizona.